Welcome! – Public Relations is a fun and exciting role where you get to try different forms of media and communication to promote your club. Here are some tips to get you started. Maintaining an up-to-date website is key to attracting new members. easy-Speak – This online tool allows Toastmasters clubs to automate their meeting planning and track and support members’ educational development. See https://easy-speak.org/portal.php for more information. See sample webpages from District 101 clubs. When it comes to organizing a special event such as an Open House, you must be sure to make people aware of it. PR flyers provide a good way to advertise your event. You can create your own with PowerPoint or Word – see sample flyers from District 101 clubs. A newsletter is a great way to keep club members informed, in case they missed some meetings. Highlight recent activities, let members know about upcoming events, and be sure to include the latest promotions from the District 101 website. Newsletters can also be used as an invitation for potential guests. 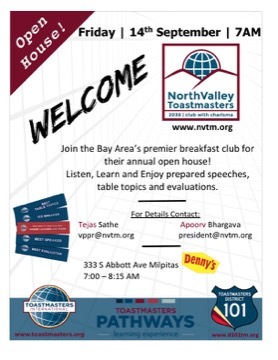 See sample newsletters from District 101 clubs. Check out our Social Media Tips for more information on how to effectively use various social media platforms to promote your club! Club Business Card – Make a lasting impression at your next club meeting, open house, or other event with your very own business cards! The business card should include your club name, meeting information, and website. Make it easy for your guest to get in touch with your club by including contact information (phone number and/or email address). 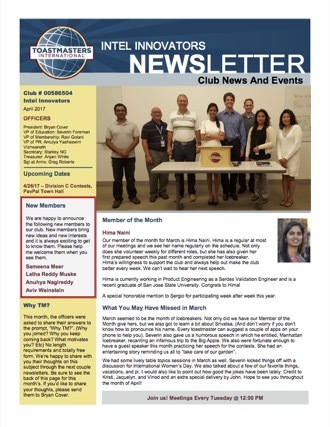 Next Step Toastmasters updates their website home page after each monthly meeting and major event involving their members to showcase club activities and member achievements. Brief text descriptions enhance collages of quality photos that provide a summary of each event/meeting. A mix of posed and action photos are used to give the viewer a sense of the club members, culture and activities. 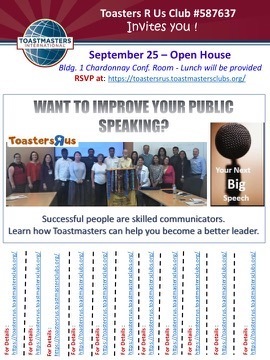 The website is hosted by FreeToastHost, which offers free hosting for Toastmasters Clubs, providing a standard format for users to follow, including a customizable table of contents and a secure area (login required) for members to access club materials. Note: The image will be reduced in size when you upload to the FreeToastHost website. The Next Step VPPR normally creates a large PowerPoint slide (30 in by 45 in) – so that the picture quality will be better. The important thing is to keep a good aspect ratio (portrait works better than landscape). When it comes to organizing a special event such as an Open House, one thing you must be sure to do is make people aware of it. PR Flyers provide a good way to advertise your event. Below are sample Open House Flyers from District 101 clubs – click on any of them to see the full-sized flyer. 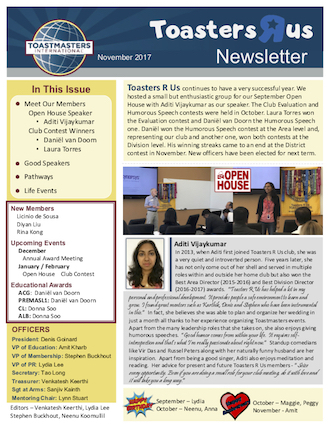 Toasters R Us publishes quarterly newsletters to remind members of recent activities, accomplishments, and exciting events. A team of editors help contribute to the publication, which highlights outstanding members and member accomplishments. A Table of Contents informs readers of what to expect in the 2-page newsletter. Colorful graphics as well as different font styles and font colors capture the reader’s attention. A special sidebar section on the second page is used to share short tips and information in graphic form. 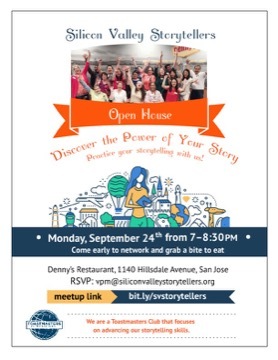 The Intel Innovators club creates and distributes newsletters to remind people about their club. As a corporate club, members may forget to come to meetings, or may drift away from the club when they become too busy. The newsletter helps remind members of the fun atmosphere the club creates, and shares some of the memorable moments from the past month. Creating the newsletter every month can be daunting, but content and articles are divided amongst the officers so no one person is overloaded. 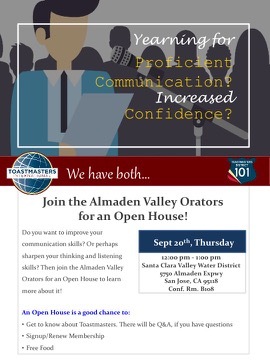 Newsletters can be made to look more professional by utilizing the official graphic elements from Toastmasters International. Toastmasters International recommends using their color palette, found on Page 2 of the Visual Brand Guidelines, on all promotional material. Newsletters are a great opportunity to recognize member achievements, highlight past activities, and promote upcoming events. Using photographs of members and club events helps readers get to know the club and see members enjoying club activities. Do you have a flyer, newsletter, website, or video that has been successful at drawing visitors and new members to your club? Share your ideas and success with your fellow Toastmasters. Send examples of your PR material to pr@d101tm.org to showcase on this page. Include a brief description of what made your PR campaign successful – content, design, who your target audience is (who you distribute it to), etc.